Taking a vacation to one of the great states in the American Southwest? We have tips and advice on what to wear in Arizona year round! The Grand Canyon: it’s one of the greatest natural wonders in the world and the primary reason for tourism through Arizona. There are a number of other cities and towns in the state that are well worth visiting, too! July is the hottest month with an average temperature of 75°F (although it feels much hotter). The wettest month is August with only a few inches of rain and winter is as cold as 34°F in January. For a full packing list, read this post on what to wear to the Grand Canyon! Naturally, you’re going to want to dress appropriately depending on the time of year you visit. But of course, being stylish is important, too! When wondering what to wear in Arizona for the Grand Canyon, go for hiking gear. It’s perfect for both actual physical activity along with ‘Gram picture taking. Read this useful guide to packing for different climates! And layers will help with the cool desert air that eventually turns scorching hot. 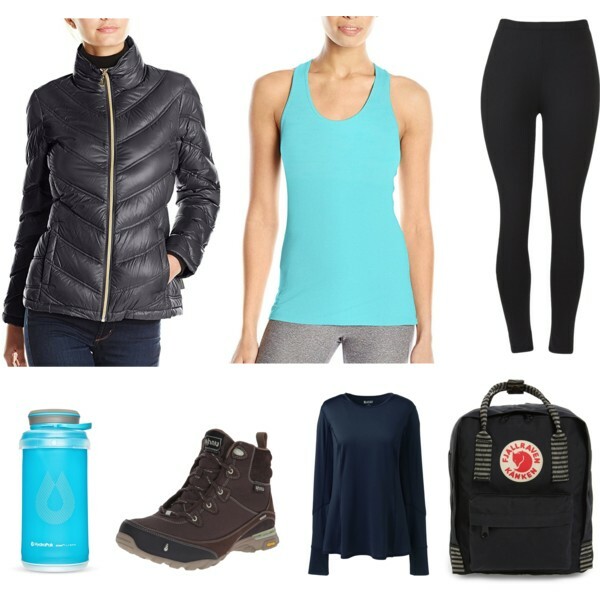 Hiking boots, leggings, a workout tank, long sleeved tops, and a puffer jacket is perfect for year-round travel at the Grand Canyon. Here are the best leggings for women who travel! 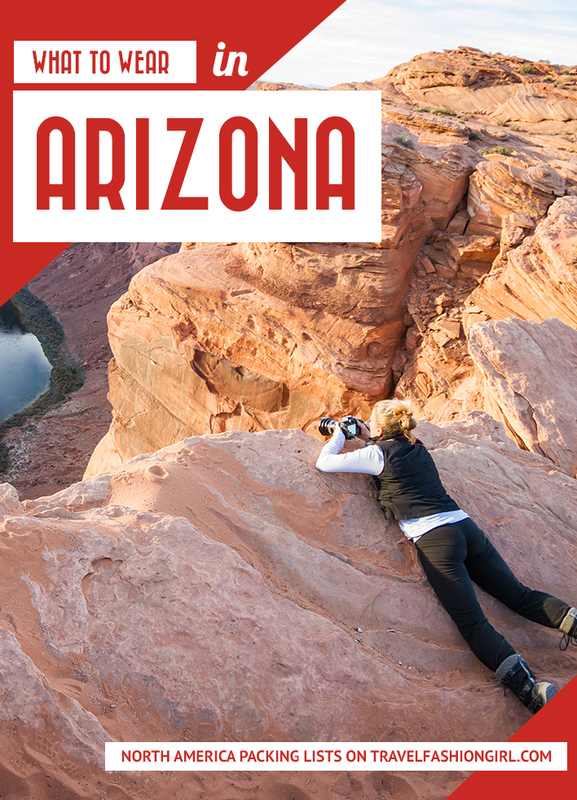 If you’re traveling through Arizona, you’re traveling to Page for one of two reasons: you’re an adventurous hiker looking for a challenge, or you’re a Pinteresty, Instagram-loving traveler looking for the perfect picture. 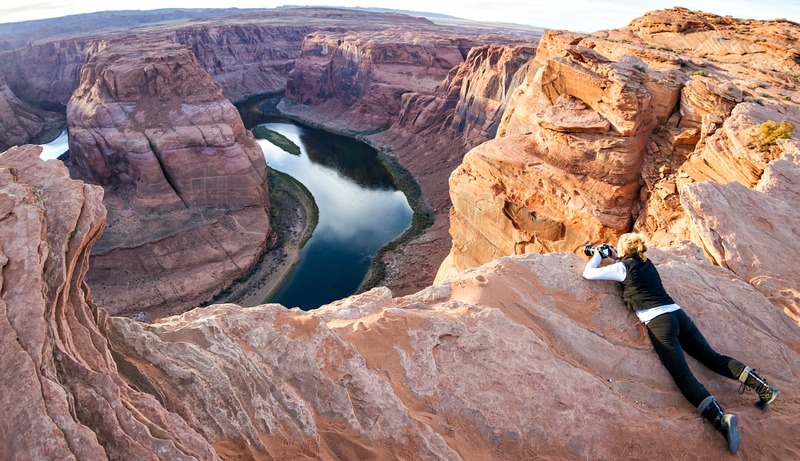 This is because of Page’s main tourist attractions: Antelope Canyon and Horseshoe Bend. Page’s weather and climate is similar to that of the Grand Canyon. It’s cold at night and in the winter, and super hot midday and in the summer. This will impact your decisions on what to wear in Arizona. Who doesn’t want to look Insta-perfect in their travel photos? 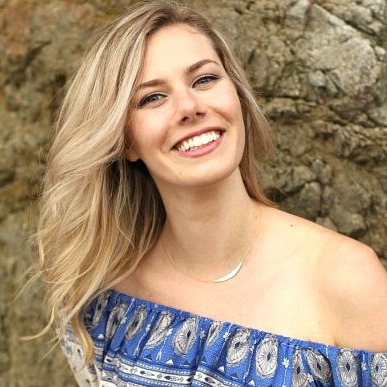 Here’s best makeup for pictures! Antelope Canyon’s tight caverns make it incredibly claustrophobic in the heat, so make sure you dress super cool with shorts and a tank top (and closed-toed shoes so you don’t get stepped on). Even in the winter, you’ll want layers so you can peel them off as you go. Take a look at these comfortable and cute walking shoes for travel! Interested in a more spiritual and natural side to Arizona? Then a trip to Sedona is calling to you! Alien lovers and the spiritually-inclined will love all of the vortexes and gemstones found in this beautiful land of red rock. L’Auberge de Sedona is a posh and tranquil getaway with several accommodation options. Nature lovers might prefer the creekside or garden cottages with outdoor showers and private balconies. But if you’re in for spectacular red rock views, the vista cottages offers unparalleled views. Pair this accommodation with the highest restaurant rated in town as well as a highly-rated spa and you’ll feel like you’ve found heaven in Sedona. Many people come here to enjoy the vibes and the spas, but Sedona is also known for its hiking scene. Beat the heat around the resort scene with light and airy dresses (both short and maxi) as well as shorts and floral tank tops. Need the best hiking gear? Check out our favorite picks! And for those of you looking for outdoor physical activity, hike the Fay Canyon Trail or the Devil’s Bridge Trail in workout shorts, athletic shoes, and a workout tee. Phoenix is the capital of and probably worthy of a single night stay (unless you’re visiting your college friends at ASU which might require a recovery day). There’s not as much to do in this city and there aren’t many hikes available, but it’s nightlife scene brings a more cosmopolitan vibe to this Arizona road trip. Keep cool with cute little dresses and a floral romper by day. Enjoy the Mexican cuisine and exciting bar scene with cute skinny jeans, a billowy top, and heels. Here’s our roundup of cute summer rompers, perfect for your warm weather travels! Hipsters and families flock to Scottsdale for its foodie and art culture scene that is seriously lacking in downtown. This is the epicenter of all things food, fun, and design and it’s time to dress the part! While it’s still just as hot here as the rest of the state, bring out a little more of your edgier and trendy side. So before you finalize what to wear in Arizona, don’t forget to pack hats (be it sun hat or boater), skinny jeans or tights, boho dresses, and trendy tanks with cute designs and colors. Accessories like hand jewelry and shades are also necessary. 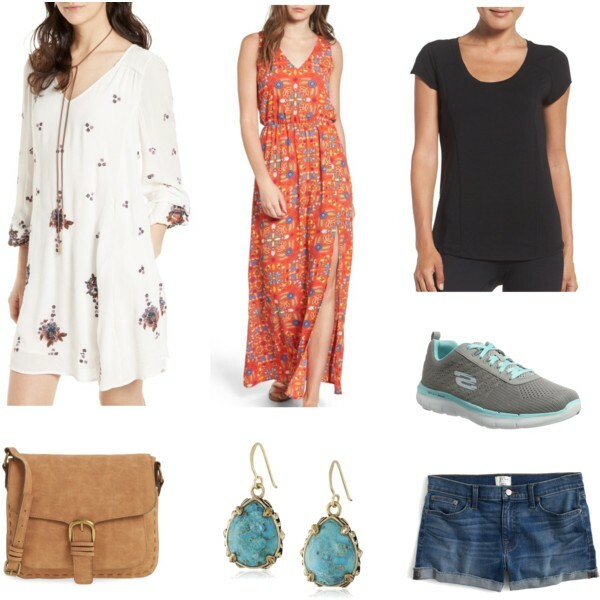 Take the stress out of packing with these 3-day weekend getaway outfits for summer! Given the number of families that live here, preppy attire is also perfectly acceptable. Casual jeans, a business casual blouse, and ballet flats or booties can be found worn by the locals. What are your tips on what to wear in Arizona? Please share in the comments below! We hope you liked this post on what to wear in Arizona. Please share with your friends on Facebook, Twitter, and Pinterest. Thanks for reading!